Recently I posted the huge drawing I did of my street here in LA. It was the culmination of a new drawing experiment I began a few weeks ago with the drawing above of the chaos on my worktable. Over the years, I have played around with bamboo pens, the favored drawing tool of my old pal Vinny Van Gogh. The marks this pen makes are instantly recognizable — they have a certain roundedness to them and can be made in many thickness and degrees of blackness. My own attempts with bamboo have heretofore been disappointing; one has to redip thepen so often that it can be quite frustrating to fill a page. But recently, a chance perusal of an art manual revealed the error of my ways. Soak the pen in water for half an hour or so, it suggested, and bamboo becomes thirsty as a diabetic camel, absorbing a huge reserve of ink that can fuel half a drawing or more. Once I had that sorted, I drew a bold outline, complete with minor variations in thickness, and was quite please with the result. Then, I decided to eschew all shading and fill in my shapes with solid gouache shapes to make a painting that was as bold as my drawing. Here and there I added a little detail and texture, but not too heavy handed. It was the sort of direct and confident drawing I have been wanting to make for ages but never quite knew what I was looking for. One of the wonderful things about my time in the garage so far has been that I can really experiment and learn new things. I am reading more of the many art books that gathered dust on my shelves in New York. I am trying to understand the media I have been using blindly for years, improving my color mixing, understanding the limitations I often bump in to and using them to my advantage. And I am studying the work of the artists I admire most, not just for inspiration and new direction, but to see if I can figure out what they were doing and why. I’m also taking more pleasure in my mistakes. I can afford to take a risk and then watch it go down in flames. A few days ago, I realize that the epic 15 foot drawing of the Venice canal I ‘d been working on for days was in fact a disaster. At first, I got quite depressed by it but then started to analyze what had gone wrong. By dissecting the composition, the line quality, the color range, I eventually figured out the errors I had made and how to avoid them in the future. I’m leaving the big panel up as a reminder. God, drawing is so endlessly interesting and complex. Just when I think I have it figured out, I turn a corner into a whole new set of lessons. My garage is a lab, a school, a graveyard, a gallery, and a great place to eat a sandwich. Previous Post My other wheels. Great tip with the bamboo pen! Love to read your ideas! Loved your article here…especially the last paragraph. It hit home. I really like the excitement of bold colors and lines in this painting! I wish we could see what you consider a “disaster”! I absolutely love and appreciate what and how you write too! Thank you! After our visit a few weeks ago I started toying with the idea of using dip pens. Last week I was working in collage and drew back into the surface with the Bamboo pen, OH MY GOSH! What fun I had watching the line dance and play on the surface. Now, I will soak the pen in water before I try my next experiment. Thanks for the great tip, Danny. enjoyed the post and the drawing – love that wine bottle – looks just like Vinny would have painted it! great post! Love the tip on the bamboo too! I’ve been doing it wrong too! I really like your thoughts on experimenting and trying new things, that you view your garage as a lab (among other things). It’s something I love about drawing and writing: there are always new things to learn, to try, to screw up, to surprise yourself with. I am noticing that the light, or something?! there in So Cal has been transcribing itself into your pictures. Having lived there for 30 years, it stirs me. I now live in Narnia: a temperate rainforest on an island in the Pacific NW, but sometimes I feel the pull, as when I see your new stuff. A great garage . . . and it has dogs! Have you found where the bamboo is growing in your neighbourhood so you can make pens as and when you need them? No, but I have found several obliging art supply stores. I’m following your progress with interest as I have charted a similar course over the years but have yet to reach any shore. The endless voyage continues, presumably to the grave. 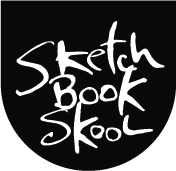 Okay, now that you are on the same side of the country as me now, you need to have a workshop and sketch crawl in your garage. Take us on tour of venice beach. We can draw and then have a lovely vegan lunch at your house. LOL! I’d pay for that, especially since I am such a recluse and would only come out if I can visit someone I trust in CA! By the way, I am not the best sketcher. I’m sure most of the people you know and hang out with are pros. I am pretty good at photography though. I’d do the photos for the event to help pay my way, and also draw for the workshop like everyone else. Like how I just invited myself? Oh, invite Dan Price too. I want to meet him as well. We can talk Tiny Homes. Oh, one more thing, even though you call your drawing a disaster, it is still awesome. I liked it, as I am sure others did as well. Sometimes mistakes can be beautiful. Really!? Soak it in water!? Sheesh. Well, this explains a lot! I’ve been doing it wrong too. Thanks for reading the manual for me! Nice post, gorgeous drawing. I bought a bamboo pen today because of it. One thing I’m unsure about though. What kind of ink do bamboo pens work best with? Is indian ink OK.? I use sumi or India ink. So that’s what I have been doing wrong. Thanks Danny. Hell Yeah! I like that – graveyard, gallery, lab and school. What more do you need? The bamboo is bold, I’m sticking with the old Pitts & Sakura Microns so far. I’m still pretty new to this drawing thing, but it’s great already. I do love your sketching and art explorations, but I first learned about you via your mini movies. Will we see any videos in the future? Soaking the bamboo pen makes sense…just like soaking bamboo chopsticks in a glass of water before using them. The water causes the wood to be smoother, to swell and not absorb liquid, but keep it on the surface. I am so enjoying your posts and sensing how much you are enjoying your time. You know I think there is much to be said for eschewing all the fiddling with shading and going with flat bold colors. I actually love this style here! 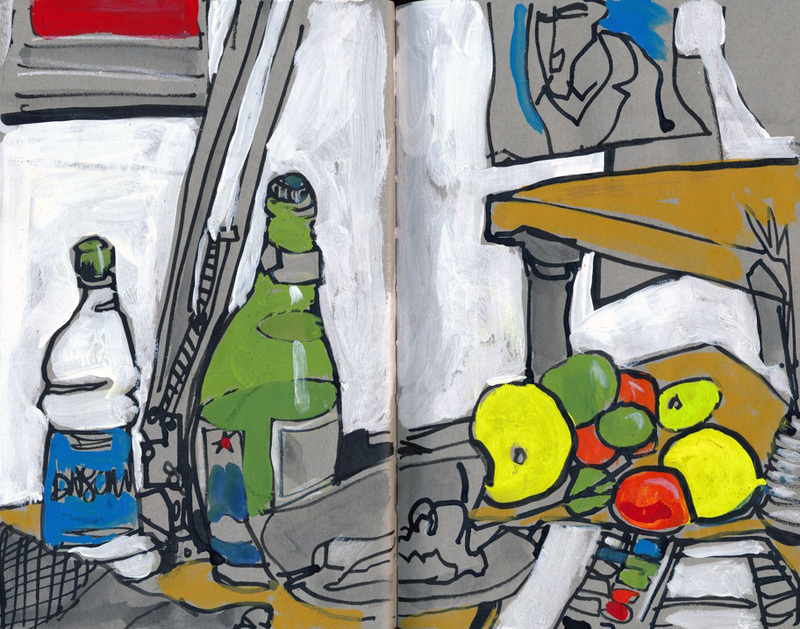 Gorgeous drawing & writing: diabetic camels, Vinny van Gogh, sunny lemons & San Pellegrino. I like Matthias’ comparison between Vincent’s moving to the SOuth of France & your own move to California. I love the bold style. Helemaal geweldig, Meneer Gregory! I hope you drew that sandwich before you ate it . . . hmmmm now where did I learn that?